Installing new cartridges is a good practice that ensures consistent high print quality. However, you should always align your cartridges after installation. Apart from that, cartridge re-alignment is necessary you are when trying to print with a printer that hasn’t been used for a long time. The tell-tell sign that your cartridges need aligning is when your printouts are imperfect along the edges or show jagged lines. Although Windows 10 comes with many printers drivers already pre-installed, it is always a good idea to update the printer software and driver for both the security and reliability of your printer. The right method to do this is to start with making sure that the software console/assistant for your printer is installed. If you don’t have the installation disc, you can simply download the software from the manufacturer’s website, which will also install the latest drivers for your printer. Most HP printers come with an app called HP Printer Assistant. Simply launch this App or its equivalent installed on your computer. Once the App has launched, go to Print & Scan and select ‘maintain your printer’ or printer maintenance which is under the Print section. This should open your printer’s toolbox, and if it does work, then consider running the printer software as an administrator. After opening the toolbox, find the Device Services section where you should see a list of printer maintenance options. Under the Device Services menu, click Align Ink Cartridges. You should receive a pop-up or a list of on-screen instructions. Just carefully follow the steps to complete the alignment process. Another requirement to confirm the readiness of the printer in terms of quality printing is to print test pages during the process. So, make sure you feed the tray with adequate papers in case you might need to print many test pages. Additionally, it is essential to go through the alignment process severally to ensure that the printing quality is the best. The test pages you are required to print during the manual process will have to be both in vertical and horizontal lines or combo. To make sure that the system aligns the print heads the right way, enter the required number of lines. You can easily launch this App by going to the Cortana search box and typing in the word Run and choosing the Run App. Alternatively, press and hold the Windows + R keys to lunch the dialog box. After it launches, type in Control Printers in the Run dialog box, and press OK.
Then it will take you to where you can select the printer that is troubling you or the one installed on your device for you to Right click. Once you Right Click, select Printing Preferences and hit it. Then, go straight to Maintenance tab and click on Custom Settings. If you prefer a manual process, simply select and click Align heads. If not, deselect it so that you can run the system automatically. You should now hit on Ok, and the screen will display instructions for you to follow attentively whether you selected the manual option or automatic. The test pages to be printed as mentioned earlier will consist of a couple of printed patterns. Make sure you count the vertical and horizontal lines on them, and there will be another window displayed for you to enter the best combination in. The data you would enter will help the software to adjust the setting. Simply go to the Run dialog box and launch the App. Once you launch it, a Devices and Printers page will come up. Select the Epson printer whose alignment you want to set and Right Click on it. After that, pick Printing Preferences and click on it. This should bring up a windows with Maintenance in a list of options. Hit Maintenance. And Print Head Alignment will pop up for you to click on. Once you click it, the dialog box for the Print Head Alignment will get lunched, and on-screen instructions will come on. Follow them keenly and to go through the process successfully. Like with the printer above, launch Runon the dialog box and type in the words Control Printers. The Devices and Printers will show up with an option to click Ok. Click it. Select the Brother printer that you want to realign its printer cartridges and Right click on it and select Printing Preferences. While on the Printing Preferences windows, pick Features and hit on it. Once you’re on Features, you’ll see Printer Services. Click on it, and the Toolbox windows will open. While inside the Toolbox, select Align the Print Cartridges and click on it to follow on-screen instructions. When on-screen instructions open, make sure you follow each of the instructions carefully to complete the process. Additionally, the test pages to be printed as mentioned earlier will require the correct input to produce the right alignment of the cartridges. If you follow the above processes on how to align these printer cartridges, you will not experience any alignment issues with your printed pages on Windows 10. With this knowledge, you can as well figure out how to go through the cartridges alignment process in other printer brands not mention here. 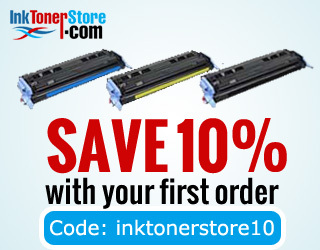 At Inktonerstore, we provide our customers with the best printer supplies at reasonable prices. Our goal is to provide excellent quality ink cartridges, toner cartridges, and other printing supplies at the lowest cost while offering the best shopping experience. Click here to browse through premium supplies for your printer!